The new generation of hiking footwear. Easier with advanced technology and outstanding design. 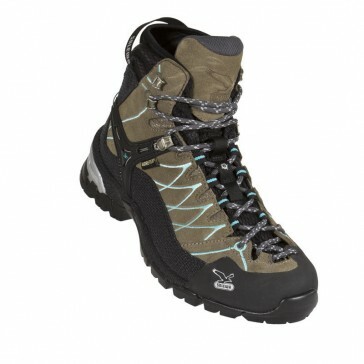 Combine the comfort and support of hiking boots with the technical features of boarding shoes. The half-height version offers more stability and security around the ankles. Here, the shaft of the shoe is divided into two parts. This unbeatable flexibility is achieved at the ankle joint, allowing mobile and agile steps and better performance when climbing. This system is positioned around the anatomic cushion in the ankle area, and creates an impenetrable, three-dimensional insert around the heel. This gives a perfect protection for the heel, very important for a bubble-free climbing. If you move sideways on steep ascents, their tendons are stretched to the limit. The 3F Function System provides full support for the ankle and at the same time the necessary freedom of movement. In this system, there is the small but effective lock on the lacing in the front foot. It prevents the laces slide down and thus provide a secure grip. The extra lacing up front at the toe provides better grip while climbing and for increased performance. Our foot is a three-dimensional body, which is defined by length, width and height. Salewa offers a footbed that also allows an individual height adjustment. The footbed is made of two soles. With a narrow foot, the MFF-layer will be added and with a wide foot it will be removed.